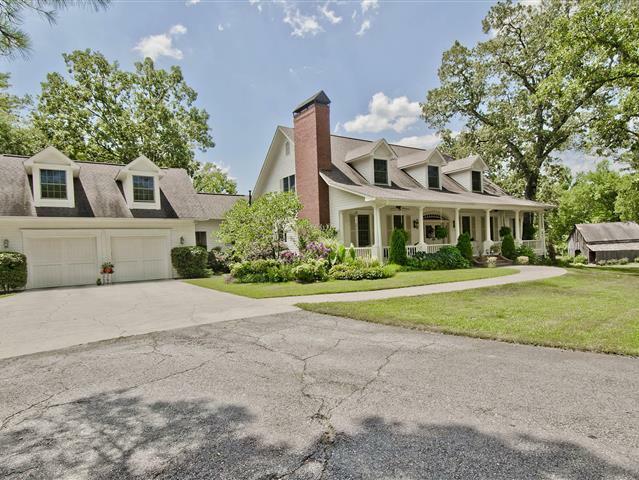 BEAUTIFUL 70+ACRE SETTING FOR THIS QUALITY BUILT HOME with a gated entry, overlooking a beautiful creek, pastures & huge trees! From a soaring entry to immaculate detail, there are generous rooms for family gatherings w/ multiple fireplaces (gas & wood-burning), hardwood & tile floors, Anderson windows/doors. Finishes include extensive mill work & cabinetry, Korian, granite, wet bar, high quality appliances and walk-in pantry. Acreage is timber/pasture and has two shop buildings, and a charming OLD barn! Must see!